As nuclear talks with the US reach a critical point, President Rouhani has called on the Americans to rectify their “wrong approach”. Facing a July 1 deadline — or possibly one of March 31 in light of recent US and Iranian comments — the two sides met from last Friday to Monday in Geneva, including two days of talks between Iranian Foreign Minister Mohammad Javad Zarif and US Secretary of State John Kerry. Zarif and Kerry are scheduled to renew discussions on Monday. Iran wants the lifting of sanctions on its oil and banking sectors within six months of a deal, but the US has indicated that the process will take years. 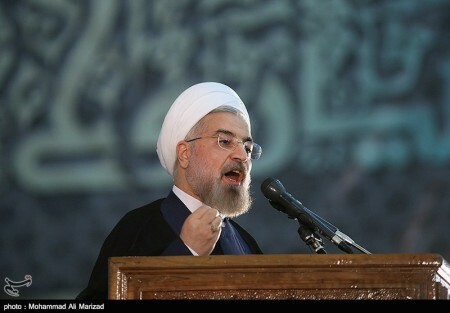 Rouhani alleged that the US had long fed the dispute over Iran’s nuclear program, preventing an agreement between Tehran and the “EU 3” (Britain, France, and Germany) at the end of 2004. He said that if the current discussions fail to achieve a resolution, “the world community will know that the opposite side is to blame”. As Iran’s Revolutionary Guards completes their three-day “Great Prophet 9” naval exercises, commanders have put out a combined statement of peace and war. The message of domestic drills is peace, friendship and security…. Islamic Iran is prepared to defend itself and the security of the region,…it has no hostility toward its neighboring countries, and…under no circumstances does it tolerate the presence of foreigners in the region. Speaker of Parliament Ali Larijani has declared that “unemployment will disappear” in the Supreme Leader’s “resistance economy”. Maintaining a defiant line amid the nuclear talks with the 5+1 Powers, Larijani said Iran must have a strong economy to stand against “arrogant aggressors”. NextIran Special: Was a Fake Photo Used for Shock Claim of “New Underground Nuclear Facility”?